There was a recipe for fresh strawberry pie I had been meaning to try. But I forgot to save the link. 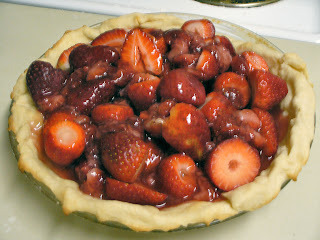 Anyway, I found one on the internet EASY FRESH STRAWBERRY PIE RECIPE so how could I resist. I know my pie would never win any ribbon for looks but the crust is so flaky!!! That recipe is thanks to my Cuisinart booklet. Since the recipe for pastry dough is enough for three pies, I made two quiches for dinner. This time I used up the left over kielbasa I had in the freezer, green onions and a combination of sharp cheddar and Parmesan cheese.